﻿Bruce Goodman's "Dorothy's ornamental elephants"
Dorothy wasn’t simply a novelist; she was a published novelist. In fact, four of her novels had been published, with satisfying sales, and a fifth novel was in the pipeline. Dorothy had a special way of celebrating each publication. She would buy an ornamental elephant. She would spend ages looking at elephants in every shop imaginable to find the elephant most suited to the novel. For example, her novel Pansy the Panda was associated with an elephant made out of real bamboo (because pandas eat bamboo, silly). All that glistens was commemorated with a rather ostentatious, and very expensive, ornamental elephant from India. It’s not that elephants had anything per se to do with the novels, it was simply an interesting and almost secretive thing that Dorothy did. And of course, she always had each elephant pointing towards the front door of the house, because to do otherwise could bring ill-fortune. “Dorothy collects elephants,” was whispered from Dorothian gift-giver to Dorothian gift-giver. 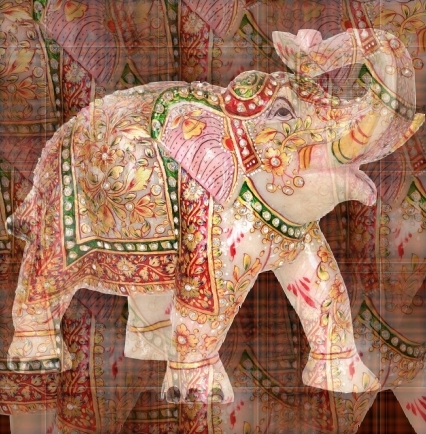 Today, Dorothy has one hundred and twenty-seven ornamental elephants. She’s thinking of commemorating novel publications in the future with ornamental peacocks or something.